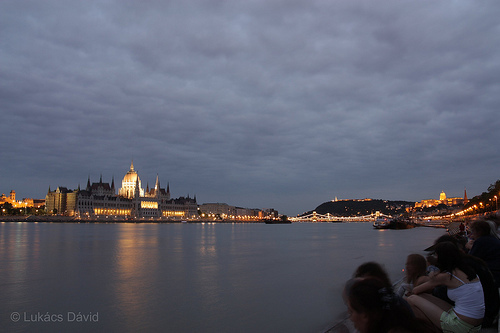 Budapest is at its most festive moment on 20 August each year, and festivities already begin on August 19 to peak in the programs of August 20. The August 20 Budapest Fireworks Show and event series is to celebrate the Hungarians, the state, the first king and the new bread of the year. While Hungarian national holidays tend to be proud and brooding, August 20 is fun, indeed the happiest Hungarian national holiday loved by locals and tourists. Did you know that Hungarians have been celebrating the consecration of bread and the harvest for many centuries? 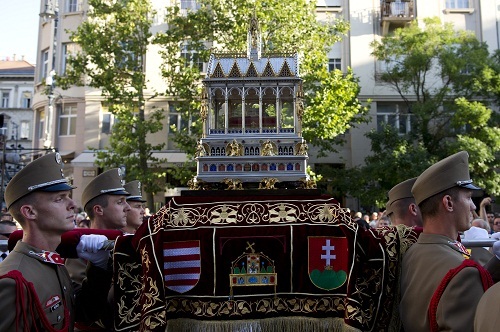 But when did it become the celebration of the first Hungarian king? August 20 has been dedicated to King Stephen I since the Hapsburg Holy Roman empress, also the queen of Hungary, Maria Theresa issued her decree on Aug 20, and requested Hungarians to commemorate St Stephen, the 1st Hungarian king crowned in 1000. August 20 is a happy national holiday with fantastic fireworks, all day concerts, food and drink stalls, and more. Every year on August 20 at approx. 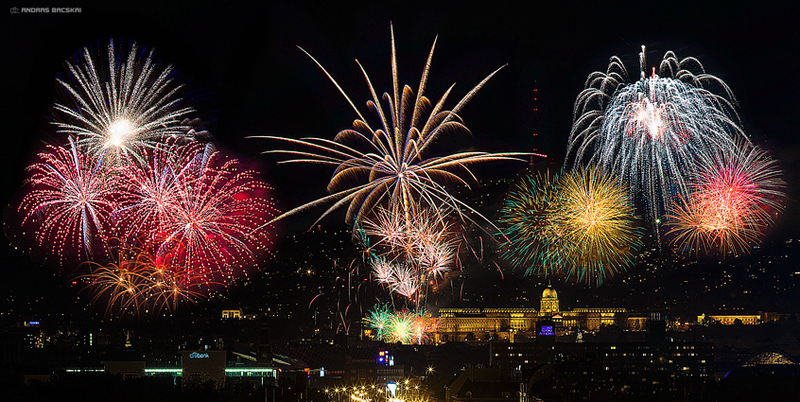 9 pm there is a spectacular Fireworks Show in the city center in Budapest. The one hour show attracts hundreds of thousands of people. The Fireworks Show starts at around 9 pm and ends at 10 pm. Venue: Budapest Chain Bridge, Batthyany Square, Szechenyi Square, Clark Adam Square, Castle Hill, Gellert Hill, Liberty Bridge, the Citadel, etc. To grab a good spot by the river (or elsewhere) arrive by 7pm or earlier, and if you do not want to elbow and squeeze through the crowds, it might be worth spending on a special dinner on Aug 20. You can watch the event from the Budapest Fireworks Cruise ships too, to avoid the crowds, and have fun with the open bar (free drinks) and buffet style dinner. A great value ship, warmly recommended. 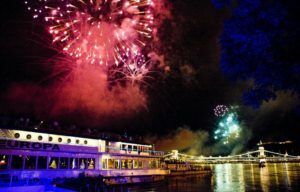 Another festive fireworks cruise includes a 4-Course Served Dinner and live Piano Battle Show: Budapest Fireworks Cruise with 4-Course Dinner. 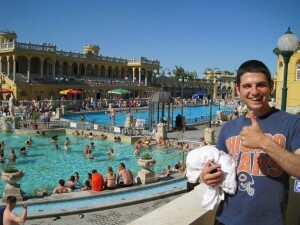 One of the summer bath parties dates is one day before, on August 19, taking place in Szechenyi Baths, Budapest. The Szechenyi Baths Party starts at 10.30 pm on Saturday. Tickets are available from €45 per person for early birds. Book your Bath Party Tickets now, before they are sold out! In fact, locals are already preparing for the big celebrations of August 20 from Aug 19, when the lovely Danube promenade on the Buda side, from the Tunnel (Clark Adam Square) to the Margaret Bridge near Margaret Island (Margitsziget) turns into a street festival, with live concerts, lots of folks out in the streets, fine wines, homemade cordials, crafts beers, Hungarian food specialties (dodolle, flodni, etc.). The 20th of August is a huge celebration, gets very crowded by night with locals travelling to Budapest from the countryside as well as Budapest residents flowing to the streets, and the fireworks are by nature quite noisy. On the other hand, the 19th of August is usually an airier, family friendly and more relaxed ‘prenuptial’ event on the same venues. On August 20 you may also see the Harvest & New Bread Procession with beautiful Hungarian folk costumes, which is connected to the Consecration of the New Bread of the year, made from the summer wheat harvested in August. Hungary is proud of its excellent flour and wheat (lots of it gets exported), so the celebration of bread has deeper impacts and roots. The bread is ceremonially consecrated on Clark Adam Square in Budapest, near the Budapest Chain Bridge, followed by a folk concert and folk dance show. The new bread is adorned with the Hungarian tricolor ribbon (red – white -green), which symbolizes the unity of life and nation. In 2018, the August 20 New Bread Consecration is at 2:30 pm on Szent Gyorgy Square in the Buda Castle, near Fisherman’s Bastion. Despite the August 20 national holiday, many of the famous thermal baths in Budapest will be open as usual, but charging weekend ticket prices, which are slightly more expensive. There are usually many tourists heading to the baths before the Fireworks Show, so you may want to speed up the entry process by getting a fast track ticket, or making sure you have a massage reserved in advance. While some find the beautiful Gellert Spa over-hyped, most agree that Szechenyi Bath is a good place to go to have watery relaxation. Every year on August 20 there is a special military ceremony when the soldiers who are advanced to a higher rank say their public vows in front of their parents, government officials, and the whole country (this event is broadcast on TV). The ceremony is on August 20, usually at about 8.30 am in the morning, on the spacious Kossuth Square near the Hungarian Parliament. 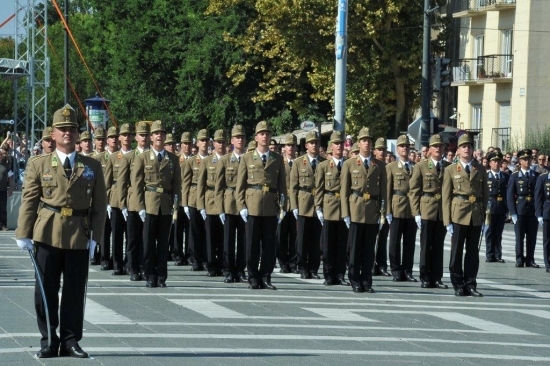 The soldiers who are taking their vows are the graduate students of the Hungarian Defence University (founded as Ludovika Academy in 1872). The venue of the Military Ceremony has been alternating in recent years (Kossuth Square or Heroes’ Square). On August 20, the winner of the Hungarian National Cake Contest is announced at 11 am on the stage at the Chain Bridge in Budapest. The stage is set up on Clark Adam Square. 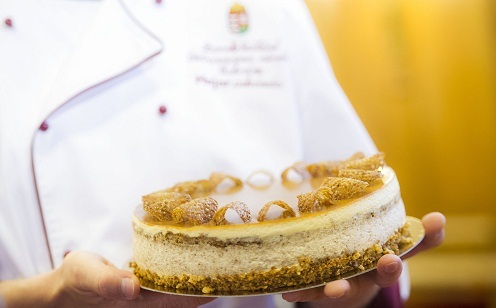 Since 2007, there have been dozens of excellent confectioneries competing for the title “Cake of Hungary” (Magyarorszag tortaja). The prize bearing cake is showcased in many pastry shops and cafes for a year, and gives appreciation to the winning confectionery. Also, there is usually a huge cake made of the winning recipe and offered for charity. One of the nicest and most unique national festivals in Budapest is the Festival of Folk Arts (Mestersegek Unnepe) where traditional Hungarian folk arts, Hungarian crafts, dances, dresses are in the focus. Many of the craftsmen present their works at the festival (also in real life making new items), concerts, dance shows, puppet shows, entertain the folks, and you can eat and drink at the festival to spend there a good half day before the evening Fireworks Show begins at 9 pm. The 3-4 day long festival’s last day is usually August 21. Head to the Buda Castle in Budapest where the courtyards of the castle turn into the festival venue. The festival entry includes a free entry to the Budapest History Museum‘s permanent exhibition. 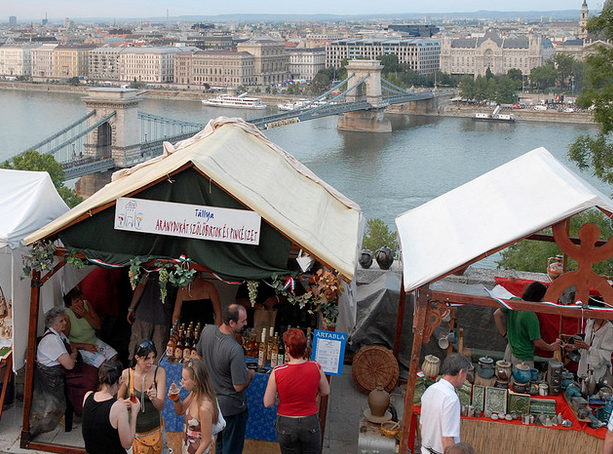 You can buy handmade crafts to take home as nice Hungarian souvenirs or gifts. If you wish to discover the Buda Castle on a guided sightseeing tour, you can book either a Buda Castle Walking Tour or a Castle District Segway Tour on Aug 20. The right hand and lower arm of the first Hungarian king, St Stephen has been well preserved (since the 11th century). The mummified relic is kept in the Holy Right Chapel in St Stephen’s Basilica in Budapest in most of the year, but on August 20, St Stephen’s Day the “Holy Right” the right arm of the sanctified Hungarian King Stephen I is taken around the city as part of the Holy Right Procession. The procession departs from St Stephen’s Basilica after the Holy Mass on August 20, at 5 pm. The first Holy Right procession in Hungary took place in 1818, then Palatine Joseph had laid down the rules of the Holy Right Procession. Until WW2 the Holy Right was taken around in the Buda Castle, between 1950 and 1987 the Holy Right Procession was forbidden by the Communist government. Since 1987 the old tradition has been revived, but these days the procession takes place in downtown Budapest in District V, starting from the St Stephen Basilica. In the 2018 the Procession and Holy Mass will start at 5 pm at the Basilica. The traditional Red Bull Air Race Shows, where the Hungarian pilot, Peter Besenyei has earned 8 prizes, usually takes place in August in Budapest, but this year it was organized between Jun 23 and 24. More about Hungarian national holidays.